Belthangady, April 17, 2015: There is a new development in the case of the death of an 18 year old girl, who was reportedly charred in an accidental fire in her house at Venur recently. The deceased is Bhagyashree (18), daughter of Shashikala and Hosamane Ramanna Poojary couple of Kukrabettu in Marodi village. It has now been learnt that a death note was found under the mattress while cleaning her room. Sources say the note has mentioned the name of one Shivappa (49), said to be a distant relative of the family who stayed nearby. Though the police had earlier once questioned the man, however before the death note was found, they have now again detained him for further questioning. The suspicion now is that of suicide and investigations are underway. 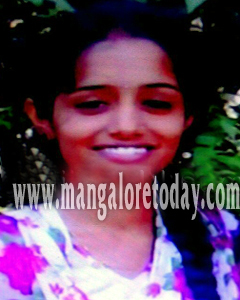 Bhagyashree was a student of Alva’s College Moodbidri and had died when she had come home during study holidays.